All hail King Candy - ruler of the race track, captain of confectionery, sovereign of sugar. 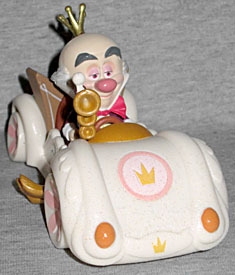 Not surprisingly, the most powerful figure in the Sugar Rush game is also the best racer on the track. He may look noble enough, but don't be fooled - this mysterious monarch rules his kingdom with a sugary fist and he is determined to keep his kingdom safe from glitches, rabble-rousers and outsiders. Don't expect him to go easy on Ralph and Vanellope. The King is ably assisted by his strong-arming security donuts, Wynnchel and Duncan, and his diminutive henchman Sour Bill, a tiny little ball of unsweetness. 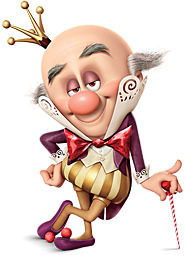 King Candy, the HNIC of Sugar Rush, is definitely a regal-looking character. He's got a tiny crown perched on his big bald head, a bowtie made from a cellophane wrapper, a purple jacket and shoes, and striped pumpkin breeches. That's "pumpkin breeches" as in "the poofy Renaissance drawers," not "pumpkin" as in "Gloyd Orangeboar's hat." His dark, curved eyebrows and half-lidded eyes make him look caring... in a condescending way. His face, voice, and mannerisms are based on Ed Wynn's version of The Mad Hatter (another Disney character). He has the same articulation as the other divers - shoulders and hips - but he's so top-heavy he can barely stand. Good thing he'll spend most of his time sitting in his car! 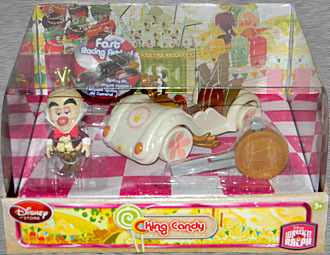 King Candy's car has no name: none of the cars are called anything in the film, but they've all been named in various tie-ins. All except this one. Maybe some kind of pun based on princess cake would be appropriate, except the car's not green and he's not a princess. Maybe he should have been, though: the car's decoration is very feminine, with its curly lines, sparkly body, and pink details. Fancy! The car (unnamed though it may be) has a unique design, much larger in the front than the back. It's more like a touring sedan than a race car - and yet King Candy always seems to win the Random Roster Race that decides which nine of the game's (at least) 15 racers will be playable the next day. He must really be a great racecar driver! The car has three horns (beep-beep horns, not stab-stab horns) and a tri-pointed seat that doubles as the King's throne: seriously, when he drives into his pink salmon throne room, he backs the car into place and it fits into a notch in the throne. The racer sets are sold in nice boxes that display the toys well. The entire top is clear, allowing full views of the car and the figure (as well as the golden coin key). 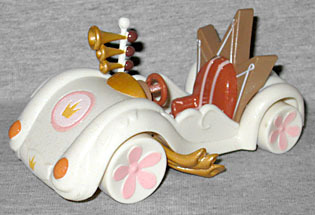 The bottom of the display is pink and white checkerboard, showing the start/finish line, while the back shows some of the grandstands - the gumballs that are on Team Snowanna Rainbeau, the gumdrops that are marks for Minty Zaki, and the hard candy that can't get enough of Swizzle "The Swizz" Malarkey. What, does no one cheer for King Candy? How sad! Still, this is a really lovely display, perfect for MOC collectors. So that's the end of these Sugar Rush racer sets. They're not great as action figures, but then, they're not meant to be: they're cars that happen to have drivers included with them. The designs are great, and it's cool to be able to own them in 3D. Turbotastic! I wonder how difficult it'd be to remove his head and attach it to... Something else.